Photo courtesy of Idaho Tourism. Whether you want to pitch your tent next to a high mountain lake or hike a technical trail among the hoodoos, Southern Idaho has you covered. Camping and hiking is as everyday as breathing in this region, and you’ll find plenty of places to relax or challenge yourself. Lake Cleveland – Nestled in the Albion Mountains of the Sawtooth National Forest, 8,300 feet above sea level, is where you’ll find one of the reasons that Idaho is nicknamed the Gem State: Lake Cleveland. The natural beauty is one of Idaho’s finest hidden gems. Just 15 miles south of Albion, Idaho, the drive to Lake Cleveland includes an astonishing 3,600 feet elevation change. The elevation makes for breathtaking view but it also makes Lake Cleveland only accessible from July to October because the colder temperatures and snow drifts. Once the roads are clear enough for drivers the Lake Cleveland campground is spotted with tents, RVS, kayaks and fishing poles. The camping areas are broken up into two sides; the east side which is equipped with seven reservable camp sites and 10 first-come, first-served sites and the west side which has 9 first-come, first served sites and is not recommended for RVs or trailers because of the steep terrain and tight turn around. Overnight use is $8-$10 per spot and certain spots can be reserved at recreation.gov. The campground area has 30 picnic tables, 25 grills, wheelchair-accessible pit toilets, beach views, and plenty of places to set in a small boat or kayak (motorized vehicles are not allowed). Hiking is available at the Twin Lakes trail head, or there are numerous short hikes around the lake area. Lake Walcott State Park – Lake Walcott State Park is located at the northwest end of the Bureau of Reclamation’s Lake Walcott Project, a welcome refuge on the edge of Idaho’s high desert. Water skiing, power boating, windsurfing, sailing and bird watching are only a few of the activities that will make your stay at Lake Walcott enjoyable. Camping areas with RV hookups are available. Picnic lovers and campers will enjoy the acres of grass beneath groves of stately eastern hardwoods. Nearby sites of interest include Minidoka Falls near the park, Rupert City Park, and the historic railroad community of Minidoka. Castle Rocks State Park – Castle Rocks, nestled in Big Cove, at the base of the 10,339-foot Cache Peak, offers diverse recreational opportunities in a magnificent setting. It is a place where solitude, natural beauty, and ranching heritage combine to enrich the visitor’s experience. The park is located two miles northwest of the village of Almo in southern Cassia County, Idaho. Evidence suggests that folks have been coming to Castle Rocks for nearly 9,000 years. Campsites are nestled among Idaho’s largest pinyon pine forest on the east slope of the 7,500-foot Smoky Mountain. City of Rocks is known worldwide for its excellent rock-climbing routes — nearly 700 in all — as well as fantastic mountain biking, hiking, horseback riding, snowshoeing, and skiing. With nearly 14,407 acres of land, you’ll have plenty of room to roam — just like the pioneers. Craters of the Moon – This fascinating lunar landscape was created by eight major volcanic flows between 15,000 and 20,000 years ago, and hiking among the ancient topography really does feel like walking the surface of the moon. It became a national monument in 1924 after legendary Idaho explorer and author Robert “Two Gun Bob” Limbert championed the area in a National Geographic article. It also made history in 1970, when a portion of the park was classified as the first federally designated wilderness. It’s a spelunkers paradise (pick up your free cave permit first) and a great place for hikers. In the spring, thousands of wildflowers make their way through the craggy rocks to put on a show. In the summer, Craters of the Moon makes for a great backpacking get away — just don’t forget to pack your water! South Hills Campgrounds – The Forest Service maintains multiple campsites in the South Hills area, including Schipper, Steer Basin, Upper and Lower Penstemon, Big Bluff, Third Fork, Porcupine Springs, Bear Gulch, Forest Service Flats, and the Harrington Picnic Area. For more information on camping fees or to reserve a spot, visit the Forest Service’s reservation website at recreation.gov. Wilson Lake Reservoir – Wilson Lake Reservoir is a 600-acre fishing spot with a boat ramp, parking, fuel and 40 camp sites. It’s a prime spot for anglers: A record perch was caught here in 1976. Thanks to grants from the Idaho Department of Parks and Recreation, this area was recently improved so it will be accessible for generations to come. The property includes a five-acre park, sandy beaches, boat docks, and plenty of places to picnic. Take your pick from one of 40 campsites in the area and enjoy the quiet. Lake Murtaugh – This low-elevation camping spot south of Murtaugh is on an irrigation reservoir. It’s an excellent destination for boating, fishing, and maybe swimming (after it gets hot — water is cold!). The recreation site is managed by Twin Falls County. McClendon Spring Campground – This semi-developed campground south of Burley, close to Malta, is an off-the-beaten-track destination managed by the BLM. It has a long history, too: McClendon Spring was a favorite resting place for emigrants along the California Trail. Salmon Falls Creek Reservoir – The campgrounds at Salmon Falls Creek Reservoir are great for anglers: This 14-mile long reservoir that provides opportunities to catch nine species of game fish. It is the premier walleye fishery in Idaho and trophy catches are a common occurrence. The reservoir has five recreation sites that provide primitive camping facilities, and one fully developed site at Salmon Dam that has designated camping units, picnic sites, recreational vehicle dump station and a boat ramp. Five Options to Maximize Summer Fun In Southern Idaho Before It’s Over! Use our Adventure Map to plan your next Southern Idaho getaway! View all of our Scenic Byways, explore our local attractions, and check out our lodging, camping, and RV availability. Family-friendly exploring or daredevil sports? Serene, soothing hot springs or raging rapids? Whatever your pleasure, we have an authentic adventure for you here in Southern Idaho! Use our complimentary travel guide to plan your perfect escape. 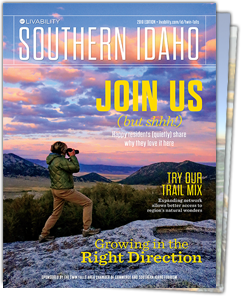 Start planning your adventure with our free full-color guide featuring helpful information, upcoming events and attractions throughout Southern Idaho. We Deliver Fun! Get info about Southern Idaho events (and deals!) in your inbox.